In order to attend ConFusion you must have a membership badge. Your badge is your pass into panels, the consuite, gaming room, autograph sessions, and much, much more. Pre-Registration closes on December 31, 2016. No Exceptions. ConFusion does not offer day badges, transfers, or refunds. ConFusion does not accept checks or money orders. Cash or Credit only. PRE-REGISTER HERE Pre-Registration is now Closed. $20 Panelist/Presenter/Game Master (must have promo code from ConFusion Staff) NEW this year! Details HERE. 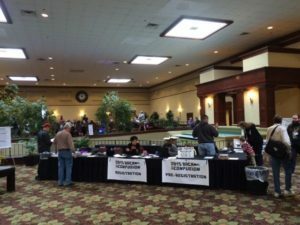 Adult: An adult badge grants access to all panels, including readings and autograph sessions, as well as access to the the consuite, gaming room, and parties. (Please note: some events may have age restrictions and will require identification) If you have any questions, please email registration@confusionsf.org. As a family-friendly convention, ConFusion welcomes children of all ages and strives to provide appropriate programming for all. With their membership each child is welcome to attend most events(see above exceptions), partake of the consuite, and is also privy to additional events for kids. If you have any questions please email: KidFusion@confusionsf.org, TeenFusion@confusionsf.org, or chair@confusionsf.org. KidFusion Pizza Party: This is a wonderful event for your kids on Saturday night of ConFusion. It is Pizza/Pajama Party. It will run from 7 p.m. to midnight. It is open to all children with KidFusion/w Pizza memberships (ages 5-12). Must register via pre-reg or at the con no later than noon on Saturday. Space is limited. Kid-in-Tow: If you plan to bring young children (under 5) to ConFusion, please register them with our kid-in-tow option. There is no charge for this membership. Although ConFusion does not offer additional services for children of this age group, having a badge will help our operations and registration staff to act quickly, if the need arises. To order ribbons please fill out the RIBBON ORDER FORM This form is now Closed. All ribbon orders must be placed before December 15, 2016. Only ribbon orders that have been paid for will be ordered. Once the order form has been submitted ConFusion Registration will send you a PayPal link within 24 hours to the email address you submit on the form.